Both Adelaide and the Western Bulldogs came out all guns blazing with their clean ball skills, quickness with the ball in hand and movement all over the ground. Adelaide debutant Chloe Scheer slotted through the opening goal and her first AFLW goal. Scheer also joined first kick, first goal club. At quarter time Adelaide were up by five points over the Western Bulldogs. Ebony Marinoff played a sensational in this opening match for Adelaide, as she has put her body on the line time and time again. Veteran defender Chelsea Randall started the match strongly in defense and showed shades of her form from last season with her incredible athleticism. If it were not for the Western Bulldog’s Lauren Spark in the backline then Adelaide would have had a greater advantage on the scoreboard. Spark was a stalwart in defense. Adelaide had all of the possession in the second term but their kicking at goal was poor. There was a momentum shift towards the Western Bulldogs halfway through the second term. 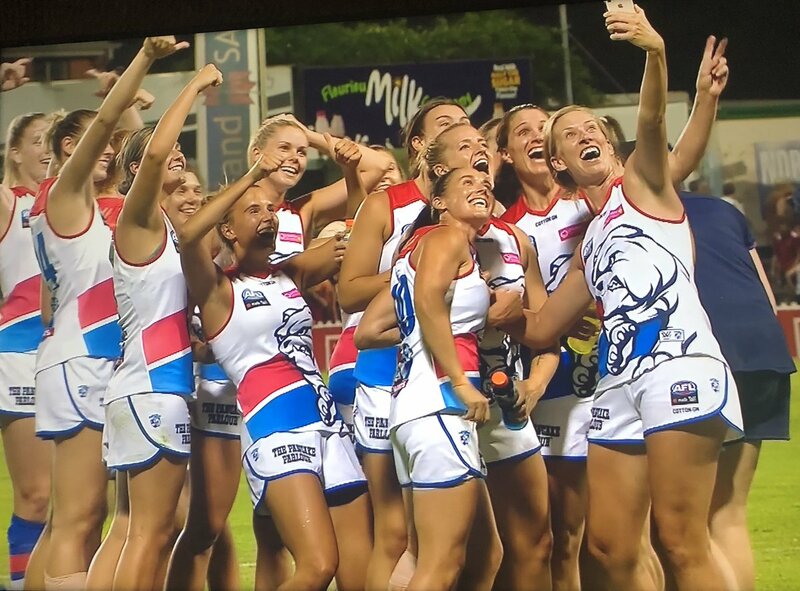 Western Bulldog’s scored their first goal for AFLW 3.0 through superstar forward Katie Brennan’s kicking boot. Minutes later Brennan slotted through her second goal of the quarter. Ellie Blackburn played a great first half in the midfield for the Western Bulldogs. At the main break Western Bulldogs led by two points over Adelaide. The ferocity did not let up in the second half. Eloise Jones crunched by Lamb in Adelaide’s forward 50. Angela Foley played exceptionally well in the ruck for Adelaide. Adelaide had all the possession and momentum with a lot of wasted chances at goal. Western Bulldog’s Monique Conti started well in the third quarter and was in every contest. Conti tackled strongly by superwoman Phillips keeping her brilliance in check. Adelaide had great transition with their smooth ball movement from their defense to forward. Phillips was everywhere for Adelaide but unfortunately all her hard work could not amount to any goals. At three quarter time the scores were tied. It was a real arm wrestle in the final quarter. Adelaide struggled to get the ball out of their back half. Western Bulldogs dominated possession in the final quarter but not able to score any goals. Spark the backline stalwart, maintained her output in defense for the Western Bulldogs. Phillips continued to play with immense intensity and finesse like only Phillips can. Kirsty Lamb was massive for the Western Bulldog in this quarter. 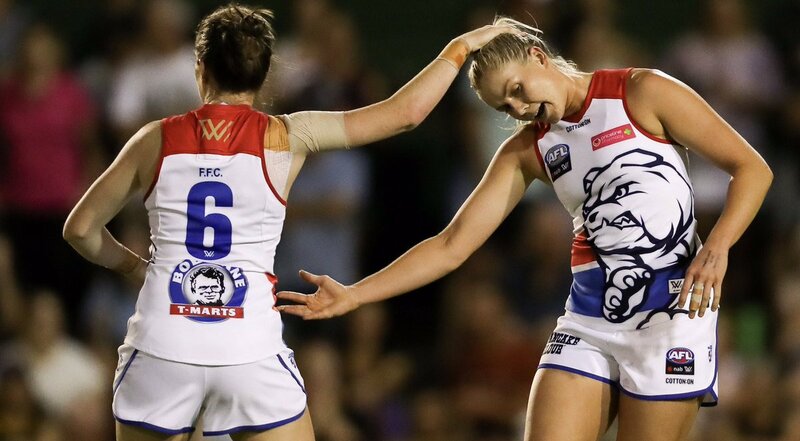 Two handy points from the Western Bulldogs in the dying minutes and they were vital, as the Western Bulldogs pulled off the win by a point. Clare Footballer and Camogie player Ailish Considine played her first game for Adelaide and she ended with 7 kicks, 2 handballs and 9 disposals. Adelaide had more scoring shots than the Western Bulldogs but they shot themselves in the foot with their poor kicking at goal and this cost them the win, as they were the better team for most of the match. The Western Bulldogs were just more accurate in front of goal and that was the difference between the two sides when the siren sounded.